The Skyline of New York City Like You've Never Seen It Before! Once New Amsterdam, nicknamed The Big Apple and known around the world as The City That Never Sleeps, New York City is THE quintessential American metropolis. More than just the familiar sights of Manhattan, the five boroughs of New York City are a collection of unique and vibrant neighborhoods that come together as one community. 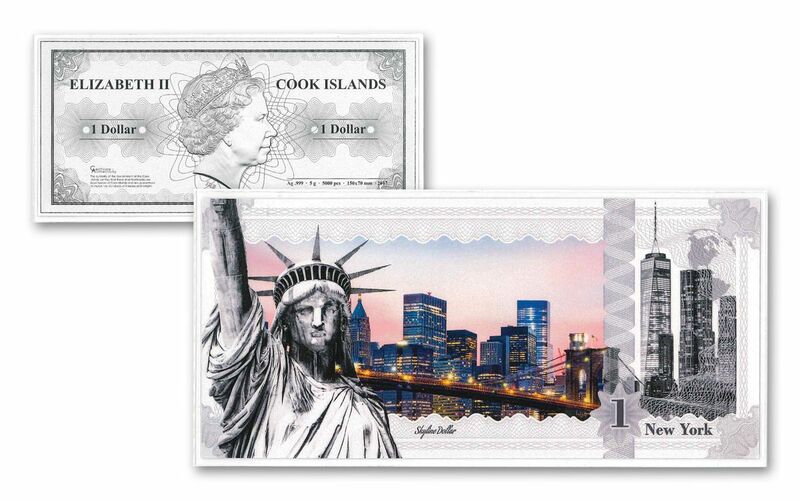 And now, you can bring the signature sights of NYC home with this first-ever legal-tender silver note -- part of the new "Skyline Dollars" collection! A WORLD FIRST! -- As you can see, this isn't your normal silver dollar! Struck in five grams of highly-pure 99.9% fine silver, each New York City Skyline Dollar is expertly minted using state-of-the-art technology. The result is the world's first legal tender silver note -- measuring 15x7 centimeters with a thickness of only.045 millimeters. That's less than half the thickness of an average sheet of paper! GLOBAL TREASURES IN VIVID COLOR! -- Advanced colorization techniques bring several of New York City's icons to beautiful life! The Statue of Liberty stands with purpose over a section of Manhattan's skyline, complimented by the city's beloved Brooklyn Bridge. 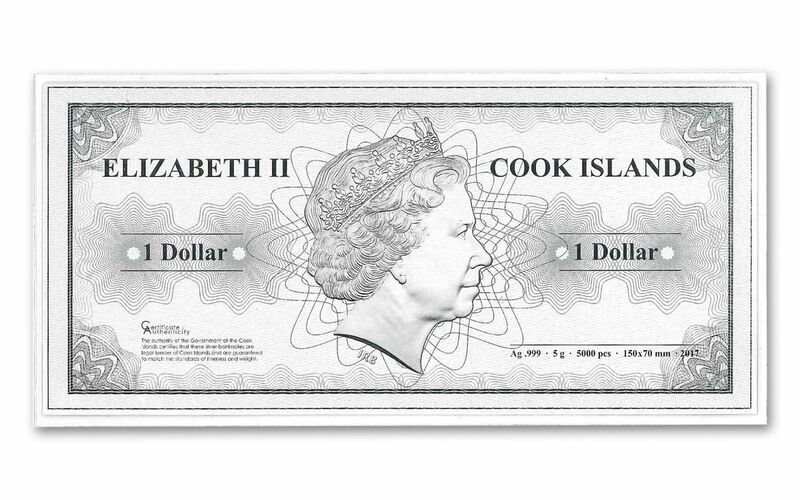 COOK ISLANDS LEGAL TENDER -- As we hinted before, each 2017 Silver New York City Skyline Dollar is one dollar Cook Islands legal tender, a fact reflected on the note's obverse along with Ian Rank-Broadley's profile of Her Majesty Queen Elizabeth II. Part of an eight-note series, this New York City Skyline Dollar is both a great collection addition AND a perfect gift for the world traveler in your life. But don't wait too long -- this note's premier status and limited mintage make it one attractive sight! 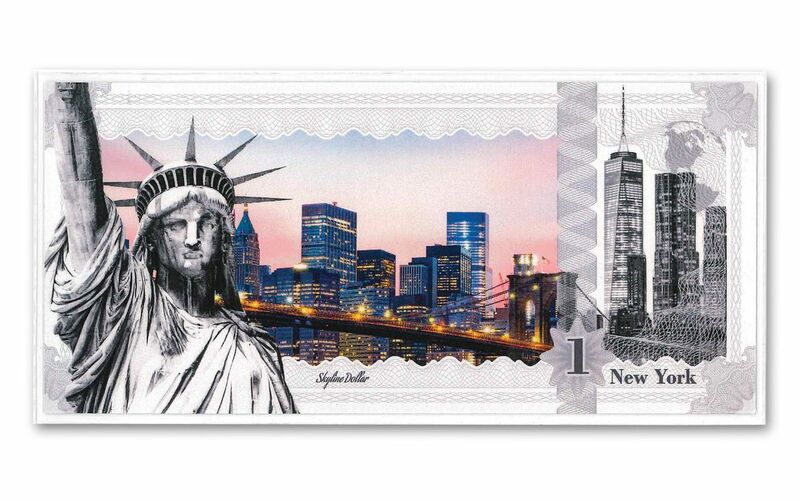 Update your itinerary and order your own New York City Skyline Dollar today!